keepdrafting.com » Blog Archive » Solo Exhibiton: OFF/GRID at David Bloch Gallery, Marrakech, Morocco. 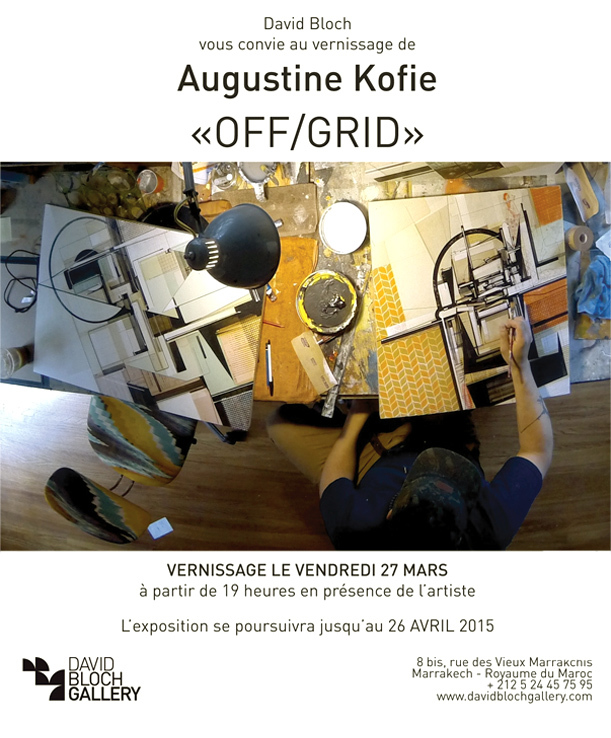 Solo Exhibition | “OFF/GRID” | David Bloch Gallery | Marrakech, Morocco. Recent works on canvas and wood created in both the US and during studio residency in the Kasbah, Marrakech + on sight installations and mural interventions. Streaming and free download of a curated 4×4Tracktor soundtrack here. The title of Augustine Kofie’s 2015 exhibition OFF/GRID refers to the tension that animates his work: the juxtaposition, and then synthesis, of opposing forces. This tension operates at a number of levels. In the arena of style, the vintage and the futurist collide. In the arena of formal composition, shapes and lines are built within a strict grid format but then break from this grid, playing off a tilt, shifting off of the established pattern, in an improvisational, freestyle experimentation. 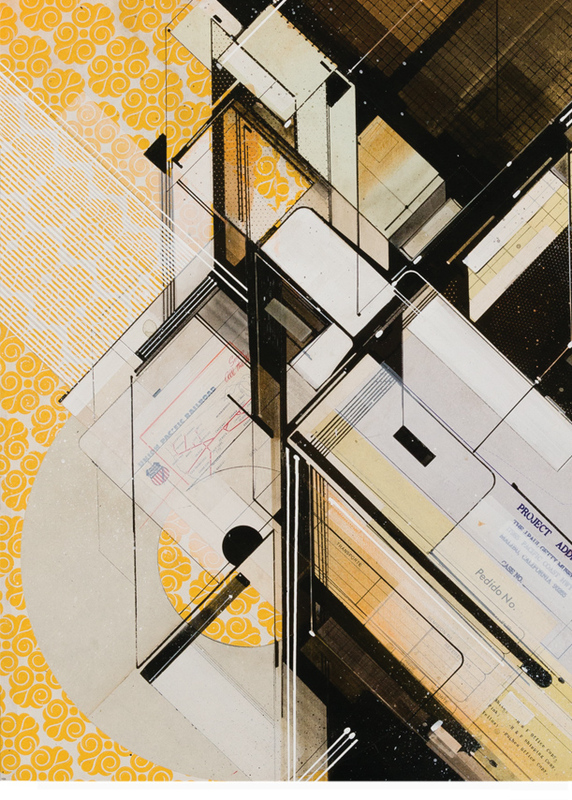 In the arena of medium, a collage technique using industrial packaging and office supply materials from the 1950s to the 1980s is filtered—rendered contemporary—through painting. 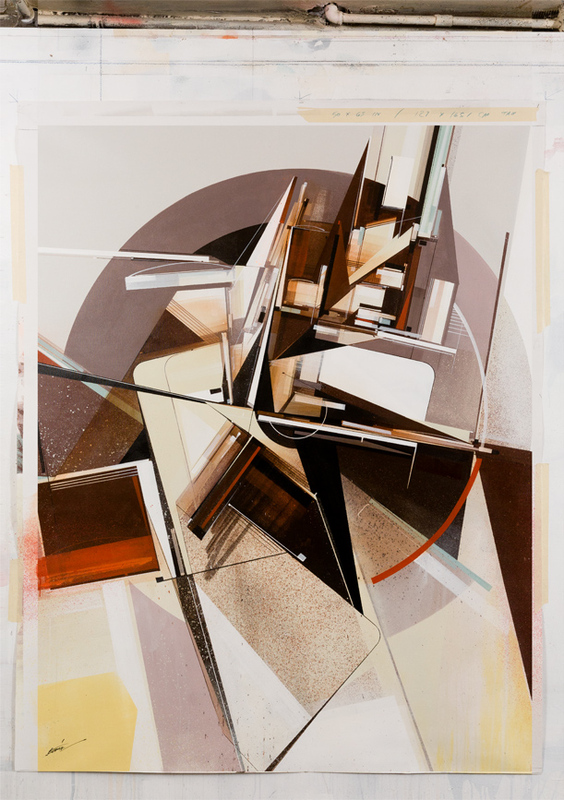 There is the constructivism of the work, which Kofie approaches like a builder—an architect or engineer—a draftsman, not a painter, making preliminary, two-dimensional sketches of a structure, but one which will never be built. This produces a paradoxical sense of time: the structure simultaneously exists in a future that will never take place, while referring back to a past that has been forgotten. OFF/GRID refers to this sci-fi temporality, a push and pull between past and future, a tilt off of the grid of time. OFF/GRID, which opens at David Bloch Gallery in Marrakech in April 2015, pushes this ongoing exploration further, this time in dialogue with its context. Kofie will be exploring oppositional synthesis by collaborating with craftsmen to produce work that merges established Moroccan artistic traditions with his own brand of American contemporary expression. The title OFF/GRID therefore also refers to the way this body of work is made off the grid of Kofie’s usual cultural milieu.